Tu es quelque Demon ou quelque Ange des cieux. De ton corps, dont il fut luy-mesmes envieux. Pour animer ta masse, ainçois ton beau printemps. Tandis qu’elle est çà bas, soulez-en vostre veuë. Tout ce qui est parfait ne dure pas long temps. You are some demon or an angel from Heaven. Of your body, which he himself envied. To give life to your form, before your fair spring. While she is here below, gorge your eyes on her. Whatever is perfect does not last long. A lovely version of the ‘divine origins’ theme: embedded not just in Classical myth, but also in Platonic thought. The ‘idea’ or ‘form’ (line 7) is, to Plato, the essence of the thing of which we perceive an imperfect version here on earth. 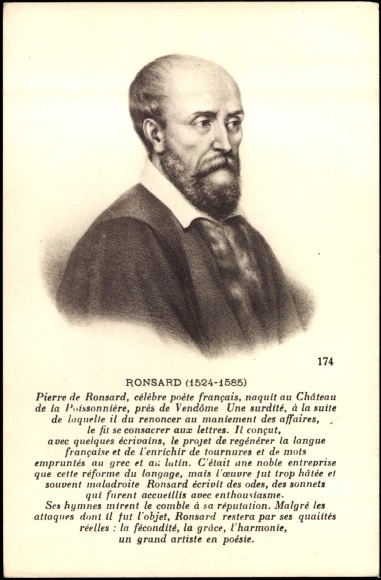 In line 4, Ronsard appears to be using ‘demon’ in contrast to ‘angel’, which is why – although Ronsard often uses the term to represent the more neutral Greek ‘daimon’ or spirit – I’ve translated it as ‘demon’ this time. The only difference in Blanchemain’s version is the gender of ‘modelle’ in line 7 – masculine rather than feminine. Though the word’s gender fluctuated, it’s far from obvious to me why Ronsard thought he needed to change it! Le Ciel à vous aimer force ma volonté. C’est seulement du Ciel l’injuste cruauté. Vous puissé-je oublier comme chose perduë. Helas ! je ne sçaurois et je le voudrois bien. Le voulant, je rencontre une force au contraire. Je n’y veux resister, il le faut laisser faire. That Heaven forces my will to love you. It is solely the unjust cruelty of Heaven. Would that I could forget you like something lost. Alas, I could not, though I wished it. Wishing it, I feel a contrary force. The last line offers an intriguing note: “laisser faire” as a widely-used term started with 18th century economists, and as far as I can see it is Corneille whom most early uses are found in. Yet here’s Ronsard decades earlier using the phrase in exactly the same way. I could use a good dictionary with a list of early usages! Ny vostre âge, qui fuit vers l’automne inclinée. Nor your age which is running on towards its Autumn. A rather harsher line 7, harsher to Ronsard that is, and one that sounds (to me) like it comes from him not her! Divins, ils ont vaincu une mortelle essence. Seulement mon visage en tesmoigne pour moy. Le voyant si desfait, ils voyent leur puissance. Que ne penetrez-vous mon cœur par la moitié ? Et aux cendres d’un mort vous ne feriez la guerre. Godlike they have overcome my mortal essence. And seeing it so transformed they can see their power. How can you not even half-penetrate my heart ? And would not make war on the ashes of a dead man. Identical in Blanchemain, and requires no commentary! La Lune est inconstante, et ton vouloir n’est qu’un. Commune est sa lumiere, et tu n’es pas commune. Tu forces par vertu l’envie et la rancune. Je ne suis, te louant, un flateur importun. Tu es toute ton Dieu, ton Astre, et ta Fortune. Ou bien tu es Pallas, ou bien l’une des Graces. The Moon is inconstant, and your will is but one. Commonplace is his light, but you are not commonplace. You overpower with your virtue both envy and resentment. In praising you, I am not just flattering again and again. You are your own god, your own star and good fortune. In spirit and learning you far surpass them. Or are Athena herself, or one of the Graces. I have replaced ‘common’ in lines 3-4 with ‘commonplace’, to avoid the connotation common has in English as the opposite of ‘genteel’ rather than of ‘unusual’. I should also draw attention to ‘Demon’ in line 12: I’m sure Ronsard is thinking here of the Greek ‘daimon’ rather than a Biblical ‘demon’ – a neutral rather than a wicked spirit. Athena here represents wisdom. Blanchemain’s early version is identical. De faim en son berceau, dont il est consommé. Mais vous avez le cœur d’un rocher enfermé. Ny de mon palle teint ja flestry comme une herbe. L’amoureux qui attend se vieillist en un jour. In its cradle from the hunger which consumes it. But you have a heart like a sealed rock. Nor on my pale colour, withered like the grass. “The lover forced to wait becomes old in a day”. Blanchemain offers “Que sa nourrice laisse…” (‘Whom its nurse has left’) in line 3. He also offers us a variant of line 9: “Fiere, ingrate et rebelle, à mon dam trop superbe” (‘Proud, ungrateful and contrary, too conceited, to my hurt’); and the information that, in 1578, these ‘Helen’ poems appeared in the ‘Amours diverses’ – moving to Helen later! Le ciel se resjouist dont la terre est marrie. Tant d’une gauche main la Parque ourdit ma vie. A fin que tout mon âge aille au gré de la peine. R’assieger Ilion pour conquerir Heleine. Rejoices in her eyes, to the earth’s regret. Fate has so left-handedly woven my life. So that all my age goes at trouble’s wish. To besiege Troy again, to conquer Helen. If you ask me, this is not only a fine poem but the neatest of Ronsard’s summaries of his poetic career. Rassieger Ilion pour conquerir Heleine. “Ores que” is better than “Et ore que” with its hiatus, consistent with Ronsard’s desire to make the near-perfect that much more perfect. That it was not a straight-line process is made clear by the variant of line 4 Blanchemain also provides from 1578: “Le ciel se resjouist dans la terre est Marie” (‘Heaven rejoices, Marie is in the ground’). Frankly, it’s a terrible soundalike for the line in the ‘definitive version’, not just because it sounds as if Heaven is rejoicing because Marie is dead, but also because rhyming ‘Marie’ with ‘Marie’ is undeniably feeble. Qui seul dedans mon cœur est ferme demeuré. Sans avoir un milieu longuement asseuré. Ainsi que je vous vey je me voy consumer. Elle vous appartient, je n’ose la nommer. See how everything changes ! Who could have expected this ? He alone is firmly stationed in my heart. Its place not long assured. As I see you, I am myself consumed. She is yours, I dare not name her. – in line 4, perhaps the idea is, ‘he is in my heart only (not yours)’ , rather than that his heart contains love and nothing else. –But, while that might be a ‘poetic’ meaning we want to infer, the grammar has to be contorted to support that reading. – in the last two lines, Ronsard is referring to Nemesis. She ‘belongs to’ Helen because, as Richelet tells us, ‘deflowered by Jupiter, Nemesis gave birth to an egg from which Helen [of Troy] hatched’: an appropriate origin for that Helen, transferred to Ronsard’s. Et me voy sans raison de douleur consumer. Vous la cognoissez bien, je n’ose la nommer. And without reason find myself consumed by grief. You know her well, I dare not name her. It’s a more ‘standard’ ending than the one Ronsard moves to, with the usual reference to vengeance in exchange for undeserved grief, and far less ‘demanding’ on the reader than the more allusive later version, which expects us to reach Nemesis through ‘punishment’ not revenge, and through the allusion to her relationship with Helen. Le temps peut toute chose à la fin effacer. Soyez douce à mon cœur, sans tant le reblesser. Son sein vous esclouit, gardez de l’offenser. Time can efface all things in the end. Be gentle with my heart, without hurting it again and again. Her breast hatched you, take care not to offend her.